These traditional recipes honor the old world ingredients and techniques Italian bakers have used for hundreds of years .The recipes might be simple........a little plain........... but ultimately, oh so satisfying! These cookies go with just about anything but were originally served with a sweet wine like Vin Santo. The Italians actually use the term "Biscotti" to refer to any type of cookie. In North America, the word "Biscotti" is used to describe a long, dry, hard, twice-baked cookie with a curved top and flat bottom and are more likely to be dunked in coffee. America imagination has gone wild when it comes to Biscotti. Here, in the states you will find them flavored with; dried fruits, chocolate, different varieties of nuts, seeds, spices, etc. They are also frequently found iced with melted chocolate or other frostings, and topped with nuts and even colored sprinkles. If you would like to try some of the more decandant versions check out our recipe selection. Click Here. 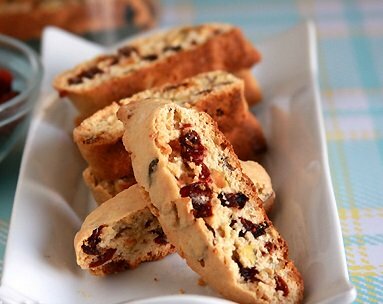 Traditional Biscotti were flavored with almonds and sometimes pine nuts. This is likely due to the fact that almonds were readily available in Italy and nearby countries. 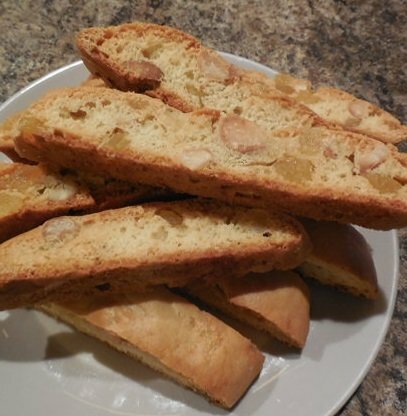 In Italy these almond studded cookies are actually called Cantucci, and they originated in the town of Prato, where made famous by Antonio Mattei. But..... it didn't take long, due to popularity, for every province in Italy developed their own unique version of this delectable Italian cookie. For more on this subject go to, What is Biscotti. Traditional Italian Biscotti is made from heavy, sticky dough that is shaped into a flattened log shape and baked until firm. After a short cooling period, the log is sliced into diagonal slices and baked again to draw out the moisture thus producing a crisp, dry textured cookie that has a long shelf life. If long shelf life is not that important, then butter or oil can be added, producing a softer texture. 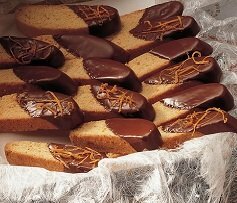 Just be aware that that these biscotti will not keep as long as the traditional recipes that use only eggs to bind the ingredients together. For more on, Making Biscotti click here. Enough said, let’s move on to some fine baking and eating.